If you are looking for a more cost effective alternative to a coffee maker, you have come to the right place! 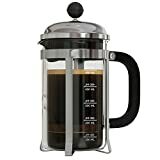 There are no shortages to the benefits of owning your own french press: they are easier to clean, brewing is quick, you have total control over brewing temperatures, and many people find the aromas and tastes of french pressed coffee infinitely better. Finding just the right press, to brew your daily dose, can seem overwhelming - until now! Here is a full french press buying guide to help you easily choose the perfect french press. Traditional French Presses: Traditional french presses consist of a holding carafe and a filter that is pressed down slowly after hot water has been added to brew coffee. They come in a variety of sizes and styles and offer shoppers great value for money. Electric French Presses: These presses differ from traditional french presses in that pre-boiling is not necessary. Water is boiled in the carafe itself, saving coffee makers the hassle of boiling and adding hot water. 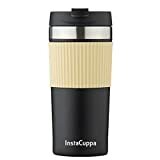 Thermal French Presses: Perfect for coffee drinkers on the go, these presses have carafes that are thermally lined to keep coffee inside the press hotter for longer. Travel French Presses: Travel french presses have no carafe and instead consist of the plunger with a lid that can be used with a travel mug. Taking up a lot less space, whether hiking or camping, users are able to take their travel presses wherever they go. Aero Presses: These coffee presses differ from french presses as they are able to press both coffee and espresso, and can be pressed directly into a cup or carafe. Using a unique pressing and filtering system only produced by one manufacturer, they are suited well for one-cup-at-a-time brewers. Cleaning: Ease of cleaning is a top talking point among online reviewers and presses that are easier to clean rate higher than those that are not. Choosing a press that can be removed from its frame or is dishwasher safe will help ensure your new press offers hassle-free cleaning. Price: Presses that offer the best quality for the lowest prices are top raters. More often than not, stainless steel french presses that are offered for competitive prices are valued higher by their owners. Compare prices of the best rated presses to choose a good quality brand for the best price to ensure you get the best value for your money. Build: Owners of presses with good quality builds and handles are more satisfied with their purchases than those who have opted for a low quality model. Another important feature owing to their satisfaction are tight quality seals between the filter and the wall which ensures coffee is brewed perfectly. Style: Reviewers prefer the style of glass carafes over any other and are willing to forgo more durable materials for a press that looks good. Presses are often used while entertaining and are on display and therefore style and design are top points for consumers when reviewing their presses. If your press will be on display, consider and choose a press that fits your personal style. How many people will you be making coffee for? Presses can be as big as 40oz to accommodate a larger family or small enough at 8oz for the singular coffee drinker in the home. Buying the correct size will ensure no coffee goes to waste or no person is left waiting for their cup. French presses can be more fragile than ordinary coffee makers, therefore investing in a good quality brand will ensure more user satisfaction and a longer life for your press. Carafes that can be removed from the frame or are dishwasher safe will be a lot easier to clean. For the best heat retention and the most durability, choose a stainless steel french press. Glass presses are the most popular style choice for users and glass won’t affect your coffee’s taste. Consider a metal or plastic framed glass press if you would like one that is stronger and more durable. Plastic french presses are less fragile and are much better suited if you plan to travel with your press or for a home where there are kids and pets around to knock it over. For more color and design options, choose a ceramic french press. Ceramic also has good heat retention. Most coffee presses will include mesh filters which are durable, can be washed and reused, and suit coarser coffee blends. A few will offer nylon filters for those coffee drinkers who like a finer blend. Some accessories to consider, to get the most out of your coffee making experience, are a coffee grinder and a water thermometer. These will make sure that coffee is ground just the way you like it and the water temperatures is just right for the perfect cup of coffee. Frieling: Established in 1988, Frieling has a diverse and innovative product range including quality coffee presses. 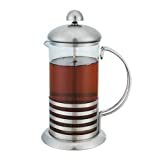 Bodum: Since launching the first press in 1944, Bodum has become synonymous with coffee, supplying presses to 55 countries.